Welcome to Shanghai, this modern international metropolis. You will be met at the airport & transferred to your hotel. Free at leisure for the rest of the day. Visit Shanghai Museum, a first-rate museum in the world, with a collection of over 120,000 pieces of Chinese art & cultural relics. Go to the Yu Garden, a typical southern Chinese classical garden, which used to be a private garden of an official in the Ming Dynasty. Move on to the landmark attraction of Shanghai-Oriental Pearl TV Tower. Standing by the Huangpu River with 468 meters high, it is the highest TV Tower in Asia. Finally come to the Bund, the famous waterfront featuring with imposing foreign buildings of the colonial period. Be transferred to airport and fly to Guilin. Upon arrival, be met by local Guilin guide and transferred to hotel. Morning enjoy the Li River Cruise down to Yangshuo, which is the highlight of any visit to Guilin, providing breathtaking views of crystal clear waters, karst peaks, bamboo forests,rice paddies and water buffaloes, just like a painting. 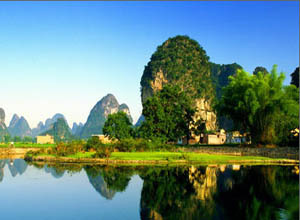 Arrive in Yangshuo, a idyllic couty. We willl take a biking tour to appreciate the unique countryside scenery as well as the simple rural life. Free time rest of the day. Drive back to Guilin and have a city tour of the Elephant Trunk Hill, The Fubo Hill and Reed Flute Cave. Elephant Trunk Hill is the symbol of Guilin city. The whole hill looks like a giant elephant with a long trunk dinking water in the river. The Fubo Hill boasts lots of rock stone carvings and Buddha statues since the Tang Dynasty and offers a panorama of Guilin at the Viewing Platform. Reed Flute Cave creates heavenly scenery by the different stone formations, enhanced with advanced lighting system. After the tour, transfer you to airport for departure. End of our service.